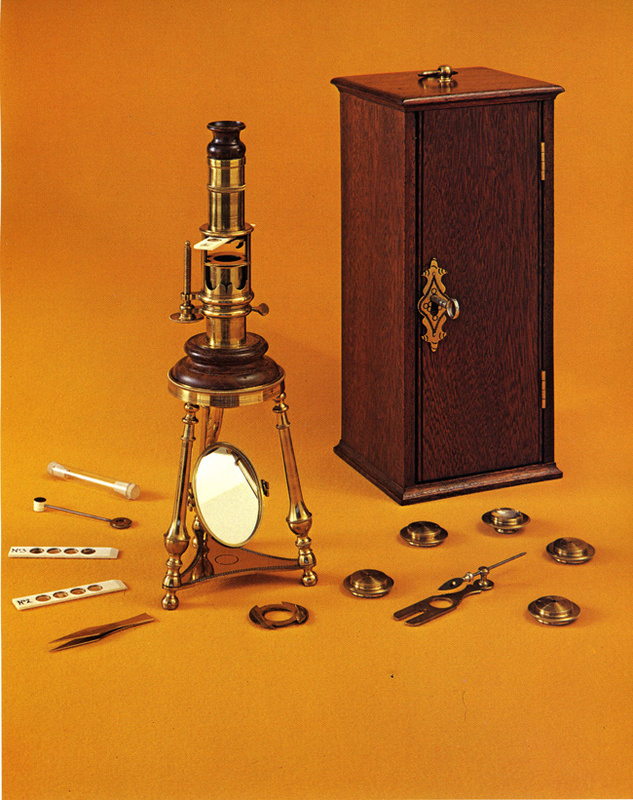 This instrument was reproduced from the original antique microscope in a British museum collection. The ornately engraved base plate, supported by three 1/2" feet, forms the mounting base for 3 scrolled brass legs 4 1/8" tall. A brass ring receives the legs and is a seat for the turned wooden section on which the body sits. A modified Bonanni type stage is fixed with 2 brass plates on both sides of a central curved plate. A set of leaf springs are riveted to press against their respective set of brass plates located below. A 15/16" diameter plano convex lens screws into the brass and wooden mount in the optical axis. The plane oval mirror is on a gimbal hanging from the curved brass arm. The screw-barrel incorporates a 1 7/8" plain brass tube and two open brass sleeves which slide over the inner tube. A brass tube, 1 3/4" long, with a wooden eye piece, forms a compound body. It screws to the upper end of the screw-barrel body when a single lens is in place. The compound body wooden mount has a 3/8" diameter ocular. Any of the 5 simple objectives in brass mounts or the Lieberkuhn lens screw into the screw-barrel sleeve. Coarse adjustment is obtained by sliding the middle sleeve on the inner tube; a thumb screw sets its position. The Cuff-like screw actually has a two start thread which gives rather rapid movement to the outer sleeve. Accessories consist of a fish tube, stage forceps, micrometer with a wire 1/60 inch, carrier for forceps or micrometer, pencil brush, 4 ivory sliders, and a pair of tweezers. The wooden case (10 5/8" H) with a decorative latch, has a bottom accessory drawer and 2 small top drawers. Simple microscope is 8 1/4" tall; compound is 10 3/4". "W.R. Fecit" is engraved along the outer sleeve. Each objective is engraved with a Roman numeral 1 through 5. The Replica Rara stamp and serial number are engraved underneath the triangular base plate. The serial number is also etched underneath the brass mounting ring.